There is something about spending your formative years as a young expatriate in Indonesia that changes you forever. Although many students at the international schools leave after high school for university, or their families move away before that, some feel a deep commitment to come back to Indonesia and give back in creative ways once they’ve ‘grown up’. But who says that ‘growing up’ has to be so serious? And sometimes the best way to give back is with a big red nose and floppy shoes. Dan Roberts, founder of the Hidung Merah Circus. Dan Roberts attended Jakarta International School from 1996 to 2002, then moved to Chicago to attend Roosevelt University and studied acting and physical theater, in particular the art of clown. His learning and teaching trajectory during college, and afterwards with his involvement in Clowns Without Borders, eventually brought the program to Jakarta. He has been teaching clown to children professionally since 2005 in the US and came back to Indonesia in 2008 to develop his organization Hidung Merah Circus (www.rednosecircus.wordpress.com). Dan was leading his first program outside of Jakarta, in Aceh, when we asked him to elaborate on his organizational and personal mission through Hidung Merah Circus. He uses the physical art of clown to teach perseverance, dedication and self-confidence to disadvantaged kids in some of Indonesia’s poorest communities. Dan said that, as important as education is to the personal and eventual professional development of kids, “not a lot of people are working to help the kids’ emotional and mental states.” What his program does is cultivate self-esteem and personal confidence, which underpin personal notions of work and success in their schoolwork and in their lives. In his work in Indonesia, he says these skills and developments are the least supported and cultivated in schools and sometimes at home. Hidung Merah Circus was never conceived of as training for circus performance, and that is not the objective of his workshops. Citing the example of one of his young students who was struggling with math in school and not putting in the time to study, Dan described discovering the student’s talent for juggling, saying he could apply the same dedication and daily discipline of practice to his studies as he did to the months he spent perfecting the juggle. It is these kinds of educational and personal development skills that Dan is trying to instill in his young students. The reason that clown seems to be such a good medium to communicate and practice these skills is because it’s fun and positive. Clown is seen as an aspect of play, but it is also a discipline and takes dedication and practice. 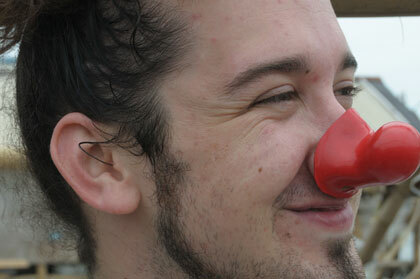 Dan started out as an actor, but soon found that his preferred style of performance involved donning a red nose. “The reason I like clown more than acting because it is so much more fun to make people laugh, and move people emotionally in a positive direction, and make people feel happy.” Dan’s motivation in coming back to Indonesia came from a sense of how much he learned from the Indonesian people during his formative years here. The development of Hidung Merah Circus has everything to do with the fundamental principle of terima kasih – to give and to receive.